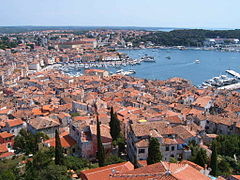 Is cathair í Rovinj (Iodáilis Rovigno) sa Chróit. Tá sí suite ar cósta iarthar na hIstria. Tá sí mar lárionad tábhachtach in Istria, in éineacht le Poreč, agus ar an Aidriadach. Go hoifigiúil is cathair dhá-theangach í le Iodáilis agus Cróitis á labhairt ag muintir na cathrach. Tugadh an leathanach seo cothrom le dáta an 7 Samhain 2018 ag 15:41.